With Joey Logano and Harvick locked in after winning the past two races, the series goes to Phoenix next week with only two spots up for grabs for the championship run at Homestead in two weeks. FORT WORTH, Texas (AP) - Kevin Harvick has won at Texas to earn a shot at another NASCAR Cup championship. Harvick shot past polesitter Ryan Blaney on the final restart in overtime Sunday. As the leader, Harvick took the outside line for the third restart in the last 35 laps. By time they got to the backstretch to start a green-white-checkered finish, Harvick had already cleared the field. Blaney had taken the lead after the second restart in that final stretch, but Harvick had gone back in front and was still in the lead when Joey Gase's spin brought out the eighth caution. Kyle Busch, also a seven-time winner this year, and defending Cup champion Martin Truex Jr. are among the other six title contenders. They are above the cut line, but Clint Boywer, Aric Almirola, Kurt Busch or Chase Elliott could advance with a win. 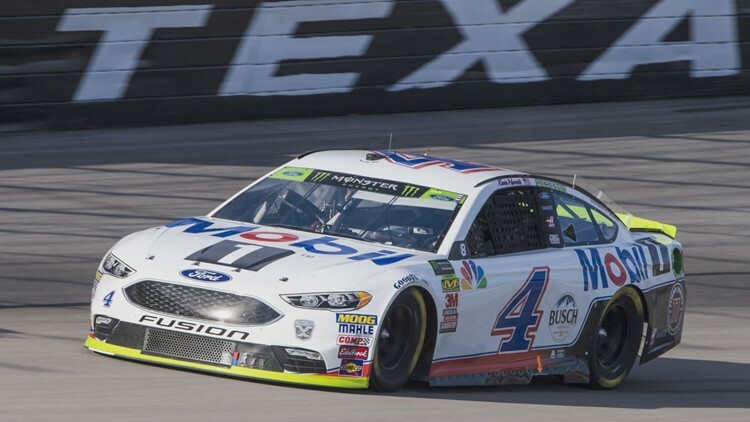 Harvick also won both stages at the 1 1/2-mile Texas track, the fourth time this season he did that and went on to win the race.